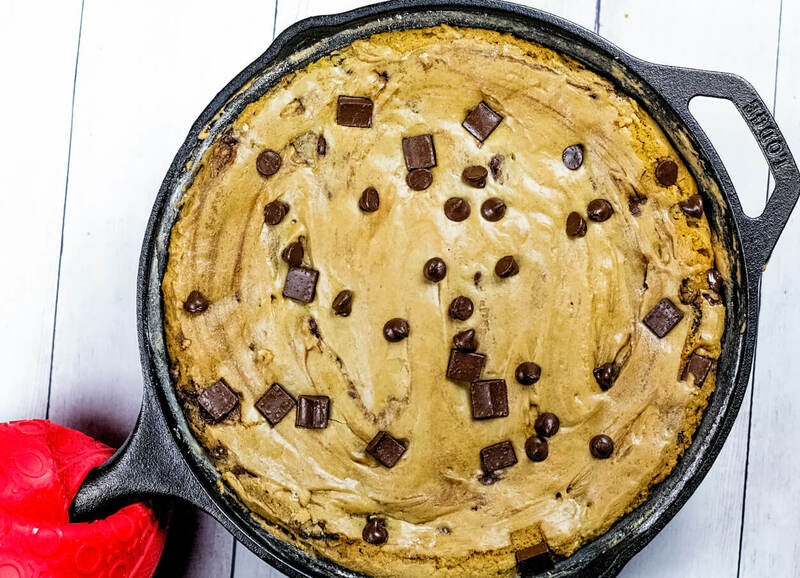 I love making this Vegan Brown Butter Chocolate Chip Skillet Cookie for a real treat. Made in a cast iron skillet with only 9 simple ingredients – no bowls or fancy mixing required! Thick and gooey with a crispy outside. What are your Christmas/holiday plans?!? J and I leave to Belgian in less than 48 hours to spend the holidays and New Year with J’s family. It will be so nice to be back in Belgium – relaxing with family and old friends as well as doing some travelling. We are also going to be getting a lot of wedding planning done. Less than 7 months to go now! 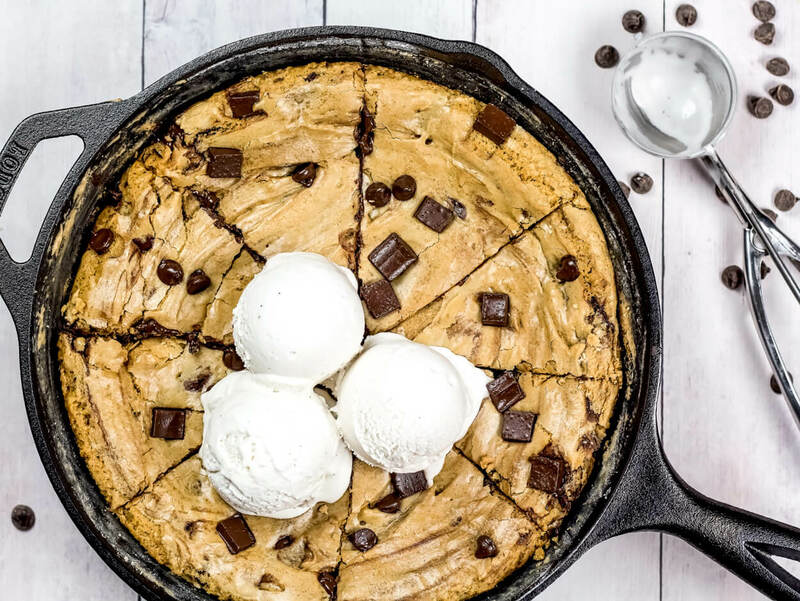 But let’s talk about this Vegan Brown Butter Chocolate Chip Skillet Cookie. 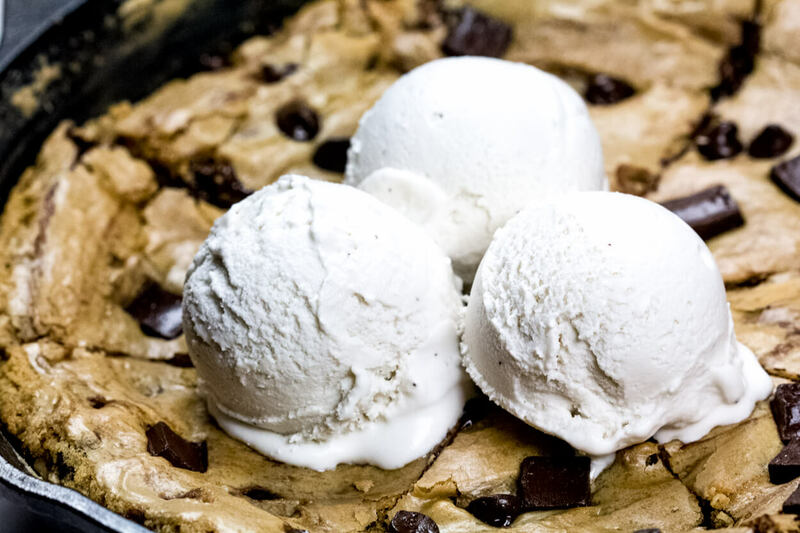 Yes, it is basically just one GIANT chocolate chip cookie. 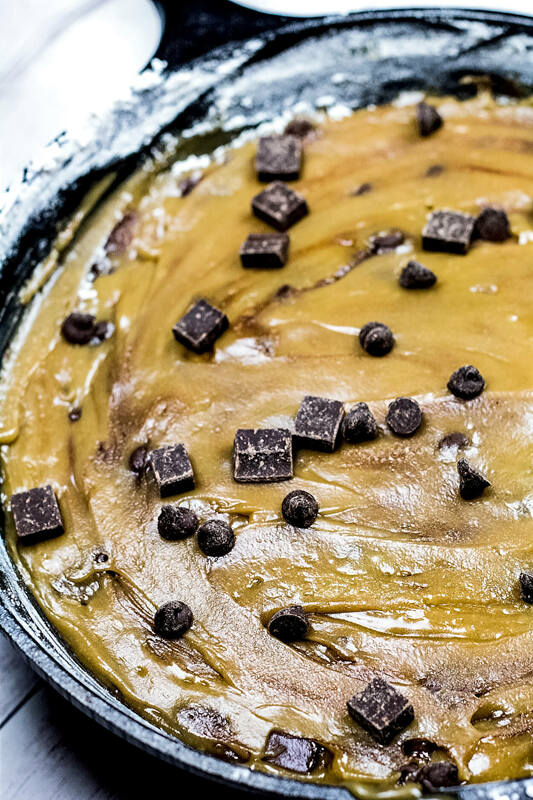 I love this recipe because it is honestly the easiest dessert to make…ever. Seriously. That’s it. 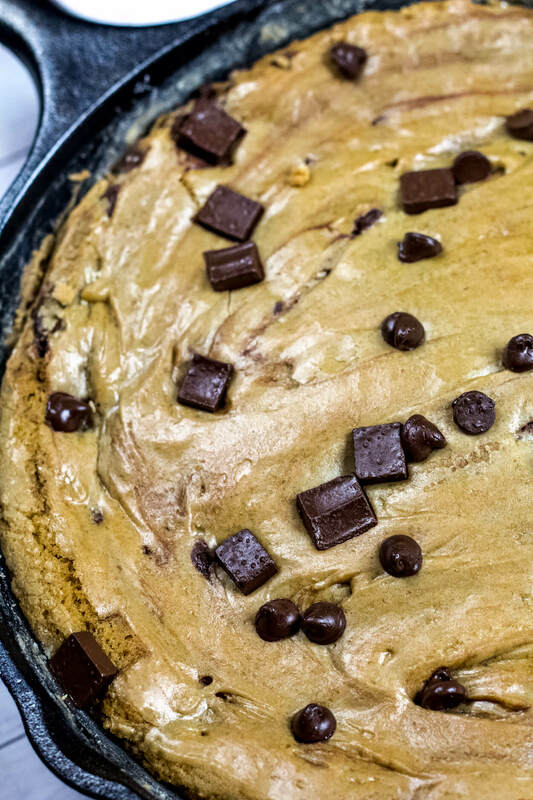 The results are a super thick, gooey, chewy yet soft and diviiiine Vegan Chocolate Chip Skillet Cookie. Baking really does not get any easier than this! I cut these Vegan Brown Butter Chocolate Chip Skillet Cookies into bars and brought them into work the next day. They were completely gone within an hour of me putting them out. 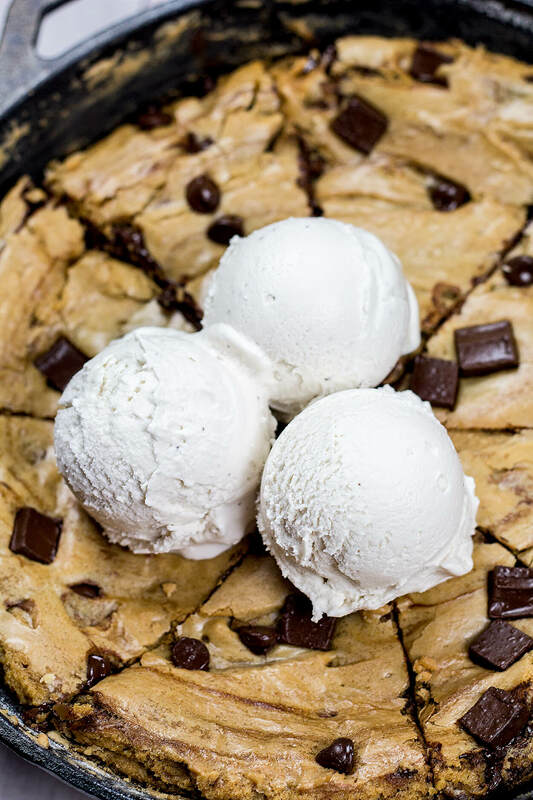 Serve warm out of the oven with vanilla ice cream. Over medium-high heat, warm the vegan butter in a cast iron skillet. Continuously stir. As the butter warms, it will begin to foam. Stir until the butter releases a nutty aroma after a couple of minutes. Be careful not to let the butter burn, if it does, remove the pan from the hot element. Stirring continuously, add the cane sugars and vanilla extract. Whisk for a couple of minutes until the sugar is melted and completely mixed in with the butter. Stirring continuously, add the aquafaba. Whisk for another couple minutes until the mixture looks like a caramel sauce. Remove from the heat and leave to cool for 10 minutes. Stir in the baking soda and sea salt. Gently stir in the flour until just combined. Stir in the chocolate chips and sprinkle a handful on top. Bake for 22 to 25 minutes. Leave to cool for 10 minutes. Slice and serve with vegan vanilla ice cream. Enjoy! Could you substitute the butter for a mixture of peanut butter and bananas? 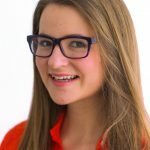 What about using a gluten free flour blend? I wonder if I would need to add more liquid?? Any ideas are appreciated. I have all ingredients on hand but we are gluten free. Thanks! Can you make it without the aquafava? Or is there something I could substitute for it? I didn’t have the aquafaba either, so I subbed ground flaxseed and water (assuming it was used as an egg replacement). It turned out pretty well, although I can’t compare it to the original recipe! Would this work as cookies, too? Hi Ceara!!!! I have all these ingredients ready to make!!!! What size pan and I DON’T have a skillet would it work with glass and what size??? I made this in a 10-inch skillet. I think it should work in a round glass pan though. Let me know how you like the recipe. Enjoy!! !